Leaving Venice was bittersweet. Especially for Allen. He took an extra liking to that city, it's alleyways, waterways and eerie silence at night. I, on the other hand will miss opening our second story windows every morning and hearing the beeping of the boats, singing gondoliers and the bustle of people in the street below. It was a different kind of noise. Not city noise like LA or NYC but a soothing constant noise that really elevated the atmosphere. In the early morning hours you would hear boats humming along the canals delivering fresh fish and conducting general commerce with the business nearby. By around 9:00am we would hear the businesses opening up and visitors and residents alike walking to and from with their groceries or walking their dogs. What I will not miss are the Mosquitoes. I feel as if all the water and humidity in and around the islands really created a nice breeding ground for them and they devoured me over the last two days like a 5 course meal - slow and steady. Still though, our parting was sweet sorrow. Before we knew it, we had our bags packed, zipped and rolling towards our next destination! The train ride to Bologna from Venice was only 2 hours on the regional train and I must say, Al and I are doing pretty well getting to and from. I was a little worried with our luggage. We tried to pack light but somehow my suitcase still came in at 48 pounds out of the 50 pound allowance. Yikes. And I thought I had packed so light. Go figure. Anyways... Once arriving in Bologna we were instructed by our host to take a bus to our apartment but with one look at the bus stops and our suitcases we opted for our own leisure and sanity to take a taxi. The cost was under 10 euros (great!) and we felt like we were on Mr. Toad's Wild Ride (the Italian version) the entire time. It was almost comical to see our driver inhale deeply, hold his breath and exhale slowly in his frustration of other drivers then glare at them as we drove by. He didn't speak a lick of English but got us to our destination, helped us with our bags and with an "arrivederci" was gone. Toad's Wild Ride indeed. Let me preface this paragraph first by saying our apartment here is perfect. It was at one time a winery and had been recently renovated into a studio. The home resides within this beautiful courtyard that is locked and gated and feels very safe. It is essentially a Hobbit hole in the ground and is small, maybe 500 square feet. 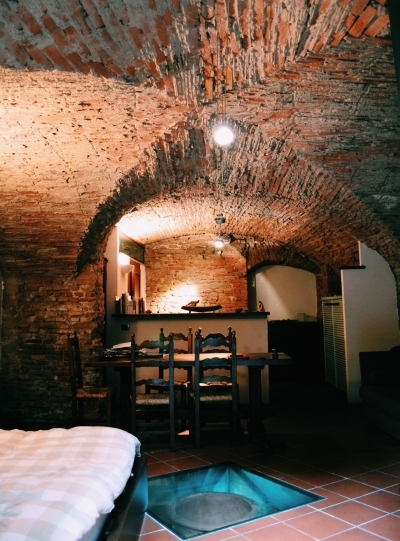 We have an ancient well in our living area and the walls and ceiling are all ancient stonework. So cool! Although we had most of the day here we were needing to catch up on sleep so we made a quick trip to the local corner market and bought some groceries (fruit, yogurt, juice, cured meats and cheese) and snacked and slept through the rest of the afternoon. Tomorrow we will be more than ready for the day!